2nd Anniversary of this Blog! I recounted here how I started this blog after going to an exhibit in January 2008 at the Municipal Art Society on Jane Jacobs. 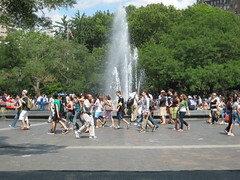 Jane Jacobs had been critically involved over the years at Washington Square Park (and, of course, New York City, in general). The goal of the exhibit was to inspire community activism. I recognized that many people in the community had tried the typical routes (go to meetings, talk to politicians, talk to your community board, hand out flyers, etc. etc.). At the exhibit, a little booklet was handed out which stated, basically, if all else fails, if you’ve tried everything, START A BLOG. That got my attention. I thought, why not? Right around the time I started, I met all these wonderful Brooklyn bloggers at a luncheon. They were all so inspiring, honest, quirky, talented, encouraging. Truthfully, if I had realized how much work it would be, I might have rethought it but this blog provided a place to practice writing in a structured way that was part activism, part journalism. I have a background in public relations so it seemed like some of that might get thrown in also. I started out wanting to tell the story of what had happened – to that point. Then, last summer (’08), new meetings about the park’s redesign began and I was able to report the story as it was happening. Curbed called this a “watchdog blog.” Along the way, this blog got written up in the New York Times, linked to by numerous other blogs and web sites, and I had written dialogue with the NYC Parks Commissioner. * Mayor Michael Bloomberg. Without him and his deft and slickly corrosive way of maneuvering through city agencies and outside groups, none of what’s happened at Washington Square Park and in our city would have been possible. 2/26/10: Right now, we’re in full swing of Phase II construction at the Park. There is a Phase III yet to come! This blog became an important space for me personally when I first started writing it — it’s written itself at times! I’ve had to slow down and post less often (I posted once a day for close to the first year and a half) and future posting will be more sporadic. Yet, there are 492 posts in the archive (check ’em out – see Categories on right hand side bar) and a lot of material has been covered here. I learn all the time from the other NYC bloggers, and it’ll be interesting to see where this whole “citizen journalism” movement goes (especially as mainstream journalists move in). If there’s one change I would have liked to have seen, it would have been more transparency and less arrogance, a change in the way the NYC Parks Department related on Washington Square Park and all park issues. While the Phase I section of the Park (around the Fountain), which opened May ’09, looks “pretty,” it also looks suburbanized, homogenized, “aligned.” Even the latest news, of those two old trees axed amidst Phase II Construction – ones that landscape designer George Vellonakis insisted would be saved – confirms another untruth, on top of too many others, from the New York City Parks Department. Another inappropriate action from a city agency, as we navigate Mayor Bloomberg’s (engineered) third term. However, the spirit of the park will live on! It’ll change (again) as the years go by. And I believe ultimately the truth (about Mayor Bloomberg, about the Parks Department under Parks Commissioner Adrian Benepe, about whatever behind-the-scenes deals that were done) will prevail. As always, thanks for reading and stopping by whether it’s been often, from time-to-time, or just today! *Links to many of the issues noted above (topics covered on this blog) here. I’m writing you a personal note to ask for your support! Whether you read my blog regularly, stop by from time to time, or totally disagree with some of my views but appreciate the updates and hard work (!!) that have gone into this blog, I thank you! — this note is for you – and you – and you! It’s hard to imagine that it’s close to two years since I started the Washington Square Park Blog (February 26, 2008) but it is. I’d never written a blog before but jumped into creating it because the issue of New York City’s actions as they affect our parks and public spaces is so important. As I was figuring out various things in my own life, this blog connected me to other bloggers (I met many of the amazing Brooklyn bloggers in person and the Manhattan & other borough bloggers have been great support virtually). Those connections have been very important to me and this blog. Washington Square Park Blog has given me the opportunity to delve into this burgeoning concept of citizen journalism and expose the intense – and sometimes joyous – details of what is happening in our City. Today, the idea of hyper-local blogs focusing on specific neighborhoods or places like Washington Square Park as a window onto the larger world has gained more traction. While I’ve been writing my blog, I also have been writing a book. At times, finding the connections between disparate news items — such as the City’s attempt to put a privately owned restaurant in Union Square Park, or the construction of the new Yankee Stadium (which involved confiscation of 22 acres of public park land that still has not been fully replaced), privatization of our parks, or the question last year of Mayoral and City Council term limits! — and writing about these topics on this blog has been so compelling that I couldn’t turn away and not write about it, sometimes at the expense of working on the book! And, of course, all the material directly related to Washington Square — the Community Board, Task Force & Landmarks Preservation Commission meetings, outlining the Phases of the redesign of the Park, letters to – and from – the NYC Parks Commissioner, write-ups in the media — NY Times, NY Daily News, NY1, Time Out NY, NYmag.com, MSN.com, Curbed (Curbed has kept me going at times and always made me laugh! ), and numerous other blogs, the re-opening of the park upon Phase I completion, highlighting events at the park, the history of the park, to, more recently, breaking the news of the discovery of the tombstone from 1799 during recent construction! – it has often been difficult to turn the stove down to simmer. I realize that when we read blogs – I read many of them! – we consider the content “free.” As it SHOULD be! There’s something really nice about the fact that it is. In case you missed it, Curbed featured yesterday’s WSP Blog entry “A Tale of Two Fences” with a great post: “Washington Square Park Fence Gate.” Check it out. Also, I’ve been corrected. The comment referenced in yesterday’s other blog post — in relation to the new lamps in the Park as items possibly purchased on sale by the Parks Department– should mention Restoration Hardware, not Home Depot. Oops. Part I of II: NYC Parks Commissioner Adrian Benepe Responds to WSP Blog Concerns! Some news! NYC Parks Commissioner Adrian Benepe responded to a letter I sent on December 18th to City Council Member Alan Gerson and Speaker Christine Quinn – with a copy to him – outlining some of my concerns with the Washington Square Park Task Force as well as elements of the park’s redesign going forward. Some of the information contained in Commissioner Benepe’s letter is informative. But Washington Square Park’s redesign still needs additional oversight, transparency, and more attention to detail and review. The Parks Commissioner has his own “misconceptions” and doesn’t address some of the substantive issues in my original letter. Nonetheless, I appreciate his response. Please feel free to write in with any of your thoughts on this. Copied on my original letter were other elected officials who comprise the Washington Square Park Task Force (along with Community Board 2 Members and community members), including City Council Member Rosie Mendez, Assembly Member Deborah Glick, State Senator Tom Duane, Congressman Jerrold Nadler, and Manhattan Borough President Scott Stringer, as well as other elected officials such as our Public Advocate Betsy Gotbaum, Comptroller William Thompson, Council Member Tony Avella, Council Member Bill de Blasio, Council Member Letitia James, Council Member Helen Foster, and more. Thank you for sending me a copy of the email you sent to various elected officials regarding the renovation of Washington Square Park. I am sorry to read the misconceptions included in your email. The renovation of Washington Square Park has probably undergone more review than almost any other Parks capital project in recent memory. The Washington Square Park Task Force, which includes representation from elected officials, Community Board 2 members and community members, has added an additional layer of oversight and provided useful feedback that has influenced us to change certain design elements. In light of the discussion about the seating alcoves at the last Task Force meeting, we have decided to revise the plans for Phase II to include two alcoves, including the one opposite the playground. In addition, in response to prior requests from Community Board 2 and the Task Force, we have increased the size of the large dog run and the height of the stage. The renovation will not result in the reduction of public space. Rather, the renovation will reduce the amount of hardscape used by pedestrians walking through the park and increase the amount of green space, making underutilized areas of the park welcoming, active and vibrant. Not only will this be a significant benefit for park users, but also an environmental benefit. Less asphalt and concrete means less rainwater runoff and therefore less strain on our overburdened drainage system, healthier trees and plants that will grow larger with a longer lifespan, more space for passive recreation activities such as picnicking or relaxing on the lawns and overall a more beautiful and usable park. Furthermore, there will be many areas where performances and other special events can be held, including the central plaza, the Holley Plaza, the Garibaldi Plaza, where the stage can be utilized, and the lawns. Similarly, you describe the chess area in misleading terms. While the overall size of the plaza is being reduced somewhat, the most critical area of the chess plaza is the chess tables, not the center which is generally empty. The renovation will include the same number of tables, but they will be new, better designed and more welcoming to more chess players – and they will be accessible to people with disabilities. There will be plenty of space for onlookers to stand and watch the games. As with the rest of the park, the renovation of the chess area will likely result in greater use, not less. While the northeast plaza is being reduced slightly, it will still serve as a gathering place for park users since it will contain 14 benches. By the way, the southeast plaza is being enlarged and will contain eight benches. Despite claims by critics of the project that the first phase would result in the removal of 32 trees, only 12 trees, many of them in declining health, have been removed, and 43 new trees were planted, four more than originally planned. We have gone to great lengths to implement the sections applicable to Parks in the October 6, 2005 letter from Council Member Alan Gerson and Council Speaker Christine Quinn, despite the fact that it is not a legally binding document. These points include the height and design of the fence, the size of the fountain plaza, the inclusion of a stage in the design, the inclusion of the mounds in a new play area and the design process for the large playground. Despite your assertion, the top of the fence has rounded balls, not “spears,” as you put it. In any case, it was never intended that people would sit on top of the fence. The renovation of Washington Square Park will guarantee that community residents, tourists, students and all New Yorkers will have the opportunity to enjoy the park as much as people have for the past 150 years – if not more so. I truly believe that you also will enjoy the renovated park when it is completed and that you will find that your fears were unwarranted. If you have any further questions or concerns, please call Rebecca Ferguson, the Washington Square Park Administrator, at 212-408-0297. Please feel free to post this letter on your blog.